Today I’m very lucky to be interviewing Victoria Sue author of Eternal Circle. Hi Victoria, thank you for agreeing to this interview. Tell us a little about yourself, your background, and your current book. 1) What are your ambitions for your writing career? 2) How many published books do you have? Can you tell us something about them? I have two published M/M series with three books in each. The Pure series and the Sirius Wolves series. I have a co-authored series with Shannon West. Before the end of the year, I will have another three books released. 3) Your main character wants to cook something special for his love interest. What does he make? I had Oliver make lasagna for Damon in Pure – Innocence which was really hard for him because of the damage to his hands he suffered when he was held captive. Oliver can’t lift anything heavy so Adam from Pure – Indulgence came to help, but got out of the way before Damon came home. 4) What are you working on at the moment? What’s it about? I’m working on a regency historical called The Innocent Auction. It’s set in London in 1810 when homosexuality was punishable by death. My two guys have to work very hard to get their HEA. 5) Do you aim for a set amount of words/pages per day? At least 2000, but that varies between none and 5000. Unfortunately the 5000 has only happened three times in twelve months. According to legend the goddess Sirius gifted humankind with powerful werewolf shifters, to bring balance and peace to the planet that both species called home – Earth. The great god Orion was pleased with his wife’s final efforts, and the werewolves he allowed to be created showed such equal amounts of strength and compassion that humans were awed and showed their gratitude by adding a full five feast days to their calendar to commemorate them. The days were named after the five oldest gods: Osiris, Heru, Set, Isis, and Nephthys. But one god was jealous. Anubis had worked tirelessly for years weighing the hearts of the dead for their goodness, and granting the dead passage into heaven or escorting them to hell. He was incensed that the ungrateful humans didn’t show him proper homage, and decided to sabotage the plans that Sirius had made. He couldn’t stop Sirius’ creation but decided that some of the wolves would be given the gifts that the dead laid at Anubis’ feet, as a way for them to barter their fate. These were special attributes, the ones that enabled humans to navigate their way to hell, and the ones that wolves weren’t naturally born with. Anubis sat back after his efforts and smiled. For every wolf and human born with strength and compassion, there would be one born with hate, greed, and jealousy. Some strong, some weak. Mostly the gifts of strength and compassion would win, but every so often a wolf would find hate, and greed, and grow strong and powerful with it. Anubis had cunning and had to do this out of sight of Orion. The great god just had his wife, Sirius, returned to him, and Anubis could not do anything that would risk his wrath. No, he had to work stealthily, as if Sirius’ creation had gone bad all on its own and he had no hand in it. Anubis watched as the gods all agreed there could be no more interference in human lives and he smiled. His own creations would bring down the werewolves and they would infect others. Anubis had patience and could wait for those days, for they would be glorious. It was stunning. Even though his vision was black and grey, the world looked sharper, cleaner. 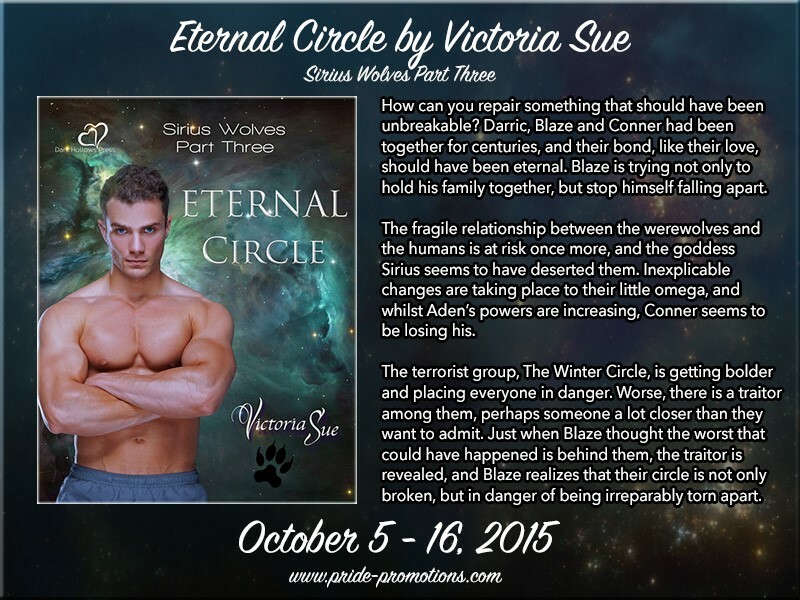 Aden felt the soft touch of Darric’s wolf in his mind, and felt the love swirl around him. The other, bigger, black Alpha- marked wolf stood beside him, Blaze’s massive head swinging cautiously to one side, scenting for possible danger. Always on the lookout, always in full-on protective mode. Aden whined and lowered himself down. Blaze was making him rest. Memories clawed at him, hurt, and he tried to push them away. This. This was when Aden felt truly, irrevocably free. As a wolf he wasn’t small and scarred. Pathetic, abused, and beaten. He felt a nudge against his side. Blaze’s wolf came and stood close, gently brushed his snout along the grey fur on Aden’s round belly protectively. No, that wasn’t fair. He was none of those things now, even as a human. Aden tucked his paws under him and panted. He knew Blaze was urging him to go home. They had agreed on the advice of the doctor that this was the last time he would shift before the baby was born. He’d known it was a risk, and not something the she-wolves did at all, but this was when he felt the most connection to his lover. This was the one time Darric had never died. The time before that beautiful body had been laid finally to rest and gone to Sirius. He knew Darric would be with Sirius until it was finally time for Aden to join him, and it wasn’t as if he was in a rush to die, but these moments as a wolf were all he had left of his silver-haired, beautiful mate, and he wanted to hold on for just a few seconds longer. Sometimes Aden wanted to disappear in his wolf and never come back. Victoria Sue has loved books for as long as she can remember. Books were always what pocket money went on and what usually Father Christmas brought. When she ran out of her kids' adventure stories, she would go raid her mom's. By the age of eight she was devouring classics like Little Women, and fell in love with love stories. She's still in love with them. Any size, any shape, any creature - love is love, no matter what it says on the box. In fact if they don't fit very neatly into any box she loves them even more! She has a very patient husband and three wonderful children. In 2010 in search of adventure they all moved from the UK to the US and are happily settled in Florida. Finally, after reading love stories for so long, she decided to write her own.